Years of Service ? - ? 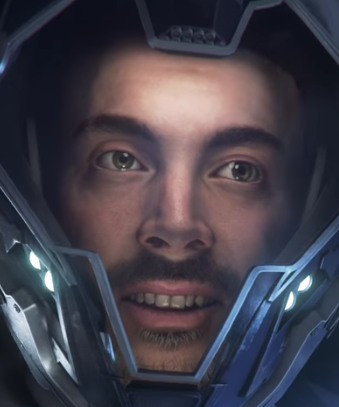 Cal Mason is a member of the 42nd Squadron and appears in Squadron 42 during the Battle of Vega II. He flies an Anvil F7A Hornet Mk II and appears to be under the command of Ryan Enright. He spend his childhood on Davien II. Cal Mason is featured in the in-lore fiction Cassandra's Tears. Lt. Mason serves in the 2930/2940s on the UEES Gemini under Admiral Showalter in the Centauri System. A Vanduul Clan accessed with human help a doomsday device ("Project Cassandra") and heads with it towards Earth. They only could be defeated by the effords of the Gemini. The device is destroyed by Mason itself. The narration uses tropes which are typical for an action film with Mason as the hero. He escapes almost unharmed from deadly situations, is a charismatic intimidator and shows an unbelievable bravery. Other things indicate that the story is not "true": Queeg, a planet in Banu Space seems to be a purely fictional and Ferron doesn't have an jump-point into Banu space.